Billy Alwardt still gathers clams the old fashioned way. The cold Vineyard winter has turned suddenly warm and a thick blanket of fog envelopes the Oak Bluffs harbor. A few yards off the bulkhead that in summer is choked with tourists quaffing umbrella drinks, a solitary figure stands in a small wooden boat, balancing with a naturalness borne of a lifetime on the water. Billy Alwardt grips a 26-foot bull rake, a long aluminum pole with a tined basket at the bottom. A small outboard motor rattles. His pace is deliberate. He rocks forward, digs into the muck on the bottom of the harbor, and drags the rake a few inches forward. He does it again and again, before hauling the pole up off the bottom and shaking the final dregs of muck out of the rake. 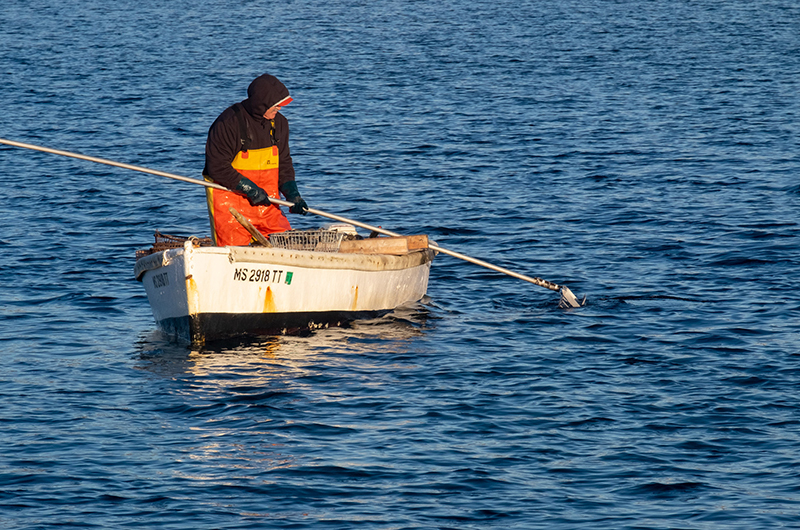 He levers the rake aboard and dumps a pile of hardshell clams on his culling board to be sorted. It is back-breaking work. He claims to be semi-retired, but he appears to be toiling harder than most fully employed workers. There is no one else around. Others are unable or unwilling to fish this hard. Mr. Alwardt is his own boss today and every day. That’s the way he likes it. These are effusive words from Mr. Alwardt, who has a gruff side. He bemoans overcrowding and overdevelopment on Martha’s Vineyard because they threaten the shellfish stock and his livelihood. He recalls days when dragging one small stretch of the harbor would yield eight bushels of littlenecks. If not for a lousy year of bay scallop fishing, he might still be scalloping this month. 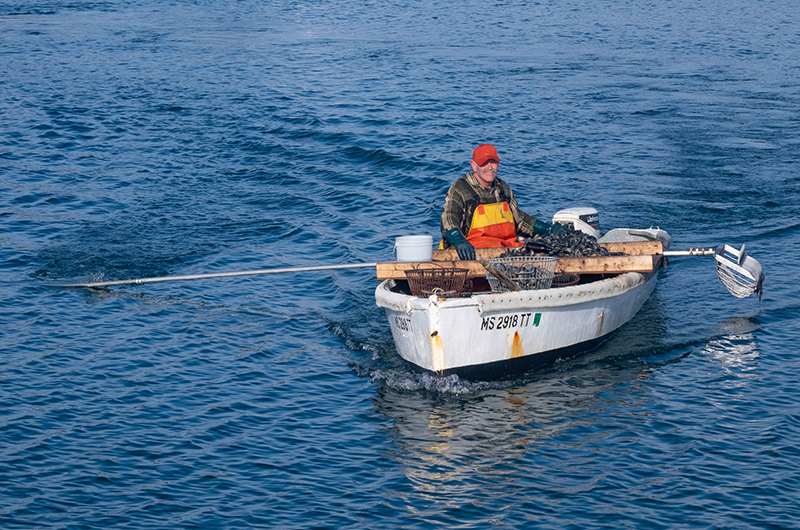 Long after most have given up trying to drag a living out of the water, he is here in the harbor, hunting littlenecks, cherrystones and chowder clams. He says there’s an art to coaxing clams off the bottom. By the look of his quickly-filling wire baskets, he seems to have mastered it. It’s a lucky time in the land of supply and demand. The price of clams is up at the moment. Mr. Alwardt thinks it may be because all the rain and stormy weather off Island has cut into the supply. 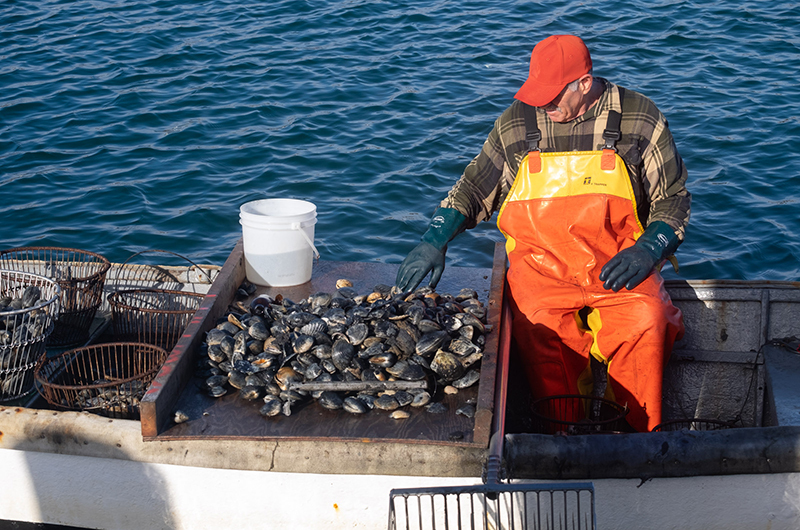 At the Boston-based wholesaler Red’s Best, which works with fish processors in New England ports, including Menemsha, Mr. Alwardt expects to fetch a wholesale price of 25 cents apiece for his littlenecks, the smallest and most delectable size he is harvesting. He’ll get 19 cents a piece for the next size, cherrystones, and 35 cents a pound for the largest chowder clams or quahaugs. It’s enough to make a little profit from a day’s hard work, but not many are willing to do it. He starts every day at 7 a.m., except for the days when the temperature falls below 28 degrees and shellfishing is prohibited. Raking quahaugs doesn’t require a lot of equipment. His boat needs to be hauled and painted once a year. The Johnson outboard motor needs a little attention. A lifetime of fishing has taught him a minimal combination of the right kind of gear makes the job easier. Billy Alwardt is doing good. Beautiful. Billy speaks the truth. Nothing better or more peaceful than going out and raking some clams for a few hours, especially if you know the good spots that are off the beaten path. Good on you Billy Alwardt!!! Long years of raking to you. Go Billy! I can not believe You are still at it! My Dad did it til He was 88. Not an easy life!